Rain of Tears for bringing back the evil that is land destruction. 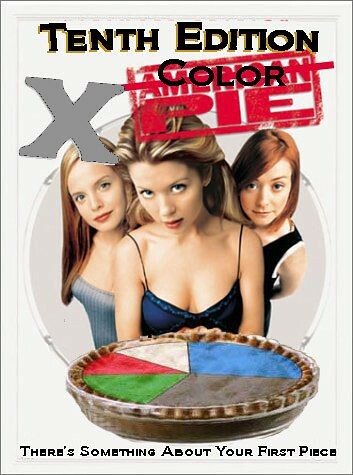 Portal is not a Core Set; lay off me. Persuasion for bringing back the creature stealing Control Magic (albeit 1 more) to Blue. Green’s two best virgin designed cards are both searching? That’s not Green at all. Wood Elves, Chord of Calling, Edge of Autumn, Fierce Empath, Natural Order, Crop Rotation. As long as it is just creatures or lands, both which Green is attuned to since it’s the “Nature” color, it’s all right. I mean, look at Living Wish. The fact that this goes with Treetop Village is great. Note: one could make the argument for the also ran as well, both could have been up here. Overrun for giving Green creature decks (are there any other kind) something to swing with. I know that this is a great card, but two of Red’s most unique flavor quirks come with this card. First is the emotion side of this. “Fine, you’re going to stand in my way, I’m going to still get you for this,” is what that one damage says. The other, Red’s short term gain at long term disadvantage is the other. Basic Magic theory says it is better to attack over and over again with a 1/1 to deal as much damage as possible then waste it on sacrifice it at the first chance possible. Please remember that the next time you play him on turn one (That’s your Magic tip of the day). Cone of Flame for showing flavor for a Red burn spell (it’s a fire cone that does damage depending on where you are in the cone). 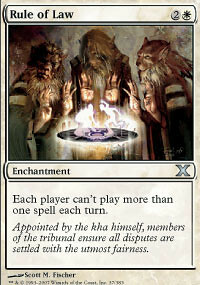 Each player can’t play more than one spell each turn. The reason why Meddling Mage didn’t get Timeshifted was that it screwed up a set mechanic: Suspend. So, storm played freely without any way to truely hose the mechanic. Oh well. Along with removing key spells from 10th, adding this card should slow down it’s dominance. But this isn’t just a hose card, but a great way to show of White’s barely used rule making ability. This is the type of control cards that I expect from White all the time. 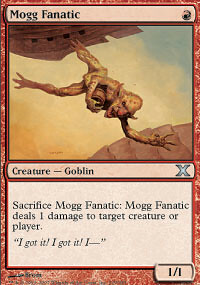 The fact that this was shifted down to an uncommon is groovy. Condemn for giving White defensive measures, which it always likes. 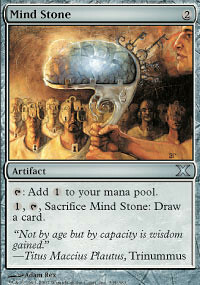 1, T, Sacrifice Mind Stone: Draw a card. Players voted this in, which was nice of them to do. It clearly states what an artifact is: objects that helps players out. It isn’t always magical spells, but things as well. Again, teaching new players about card advantage and multiple uses isn’t such a bad thing. You can fit this into almost any deck and if you don’t need it, it replaces itself. Good job voters, pat yourself on the back. Leonin Scimitar for showing that not all equipment that’s good has to be broken.